Dr. Melanie Leung joined the TSO Fall Creek practice in the spring of 2015. She is a certified therapeutic optometrist and glaucoma specialist, receiving her doctorate from the University of Houston College of Optometry in 2013. Dr. Leung graduated from the University of Texas at Austin with a Bachelor of Science degree in Human Biology in 2007. 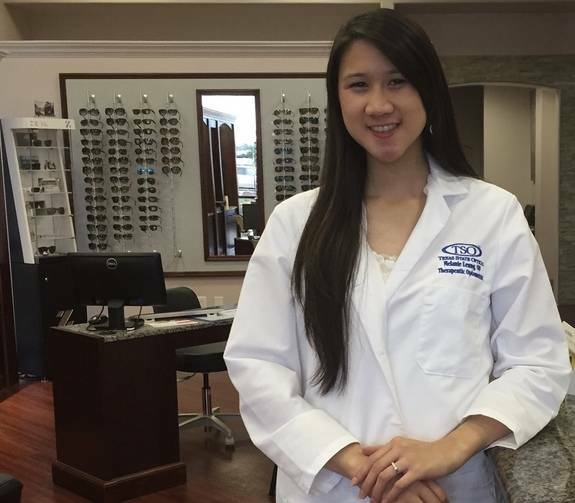 During her optometry schooling, Dr. Leung gained medical experience focusing on retinal disease through her externship at Memorial Hermann Cizik Eye Center. She also gained clinical experience at Lakeline Vision Source in Austin. In her last year of school, she participated in a medical mission trip to Mexico, screening patients for retinal diseases and distributing glasses. Since graduation, Dr. Leung has been serving the community of Willowbrook in northwest Houston. She enjoys caring for her patients and educating them on their eye health. In her free time, she enjoys watching movies, traveling, spending time with family and friends, and being involved in the church.